There is a lot more to Kyoto than its countless world heritage temples and shrines. The city is also a great destination in which to experience some authentic Japanese traditions. 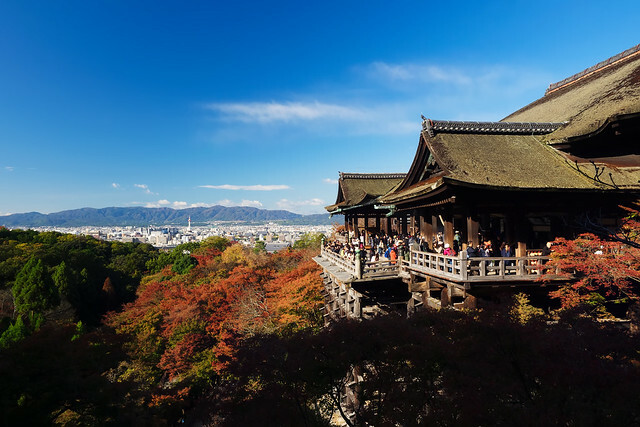 You can access Kyoto from all major cities using your Japan Rail Pass. If you want to immerse yourself in all that the city has to offer check out the following Things to Do in Kyoto. If you have been wanting to try a kimono, dress up as a maiko (an apprentice geiko) and roam the streets of Kyoto to get the full experience. With a nihongami wig and the typical maiko make-up, you will look like you are ready to perform traditional Japanese songs and dances, just as maiko did during the Edo Period. In Kyoto, there are numerous studios that offer this type of service, and they can also take photos of you in costume at various tourist spots in the city. Kyoto is home to some of Japan’s best quality arts and crafts. Its pottery products are highly admired all over the country, most particularly its signature pottery style known as Kiyomizu pottery. Moreover, its porcelain and ceramic wares used in tea ceremonies bear lavish and intricate designs that only experienced and skillful hands are able to create. It is also known for top quality kimono, folding fans, lacquer ware, and Shinto crowns, instruments and masks that symbolise the city’s long history and traditions. You can get a taste of these Kyoto traditional crafts by visiting the Kyoto Museum of Traditional Crafts, Kyoto Handicraft Centre, and Nishijin Textile Centre. If looking at examples of Japan’s 2,000 year old tradition of making pottery has inspired you, you may want to learn how to make various pottery products as part of your things-to-do-in-Kyoto list. You can practise sculpting and moulding earthenware by signing up for a pottery class or workshop offered by the various pottery schools in the city. Many instructors speak English fluently, so you will easily be able to follow the instructions and techniques to make your own bowls, cups and pots. The Japanese green tea ceremony is an important local tradition that exposes you to the history of Japanese tea and its link to Zen Buddhism and other customs. It is an art that symbolises spirituality and features various unique utensils used in making tea. In Kyoto’s Gion district, there are old Japanese teahouses where you can experience a green tea ceremony. Prepare yourself not only to enjoy a cup, but also to make your own from green tea leaves. Attend a calligraphy class to learn how to write Japanese characters. Master the fundamental forms and steps on how to effectively execute brush strokes to create a beautiful artwork that you can keep as a souvenir. You also get the chance to learn the history and development of Kanji through Japan’s history. Gion is known as Kyoto’s geisha district, and you can stroll along its streets to enjoy the old Japanese-style houses and buildings. After that, enjoy a hearty dinner with a maiko at a restaurant to discover more about their way of life and role in Japanese history. A Japanese tradition that started around the 7th century, ikebana is the art of flower arrangement. It was originally used to make floral offerings for altars. Through the years, it has developed into both an art and a discipline that bring together humanity and nature. It is more than just placing flowers in a vase or pot. It is a way to express one’s creativity through the right combination of colours, lines and shapes. There is much more to be done in Asia. Here are a couple of ideas. Kyoto have own story of culture that unique place in all over the world.You have lot of fun and enjoy.